This post originally appeared on Disinfo.com on May 14, 2015. 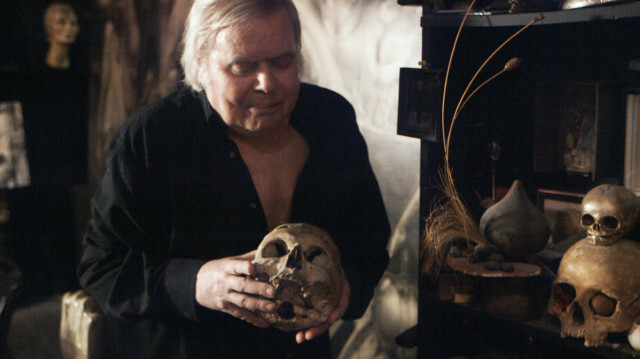 Giger holding his first human skull. 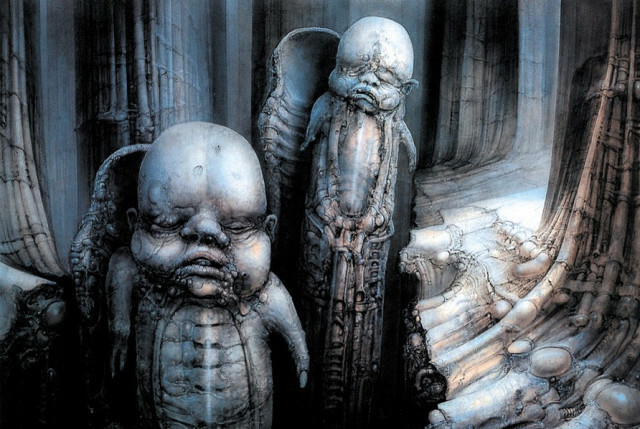 It was a gift from his father when Giger was only six. 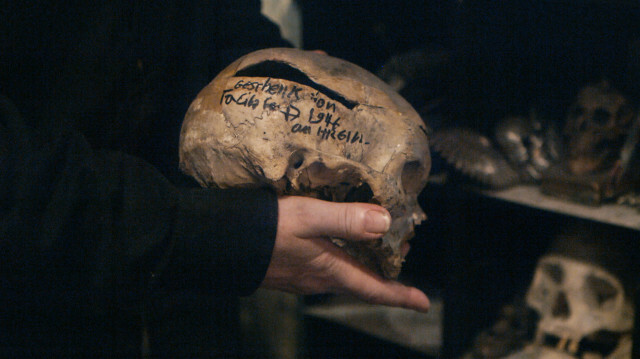 In the film, Giger explains that he would drag the skull down the street by a string. One year ago this month, the iconic sci-fi artist, H.R. Giger, passed away. Undoubtedly his legacy will live on, not only as the creator of the Alien, but also as the preeminent producer of biomechanical art. Filmmaker Belinda Sallin’s Dark Star: H.R. 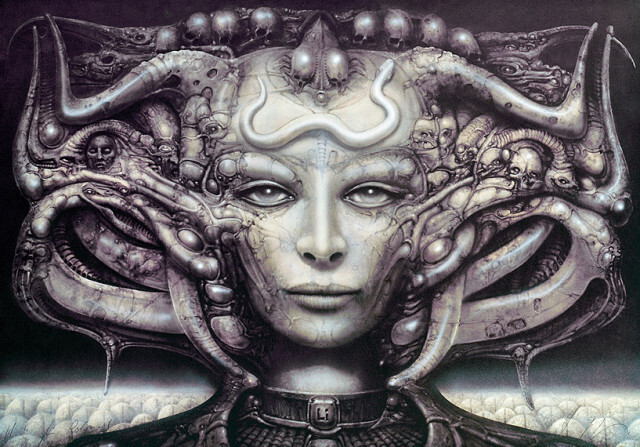 Giger’s World is a stunning tribute to the man and his work. 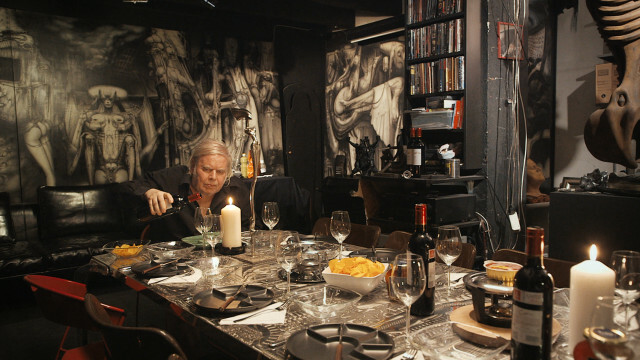 Premiering only months after Giger passed away, the film explores the totality of Giger’s life and work in a way few documentaries are able to do. Unlike posthumous documentaries, Dark Star exists in a definitive and finite atmosphere starring the subject himself. The film expertly encapsulates and immerses itself within the same, dark world that Giger and his work inhabited. 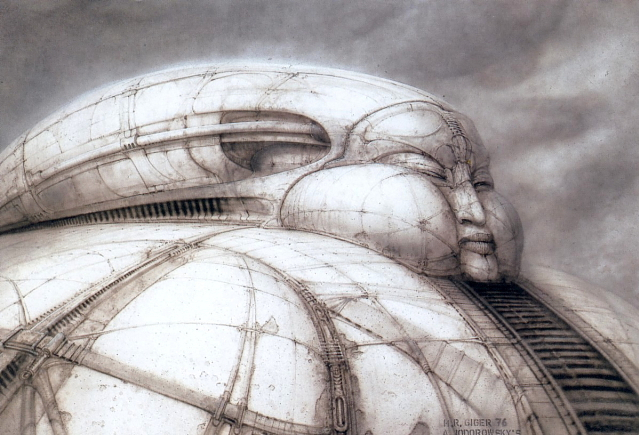 Dark Star opens with a winding shot from high to low angles of Giger’s eccentric house. 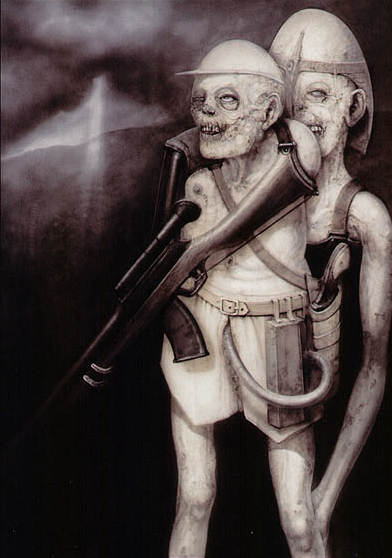 From there we enter his world — a claustrophobic, pack-rat house filled with biomechanoid sculptures and paintings, skulls, and all things macabre. And yet, Sallin manages to capture the warm and inviting spirit of Giger, his family, and friends. While exploring the nooks and crannies (quite literally) of Giger’s fascinating life, the film jumps between different points in Giger’s life interlacing beautiful montages of Giger’s artwork. The score and intimate camerawork produces a dreamlike quality that pairs well with the disjointed narrative. Peter Scherer, an exceptional Swiss film composer, created the haunting and atmospheric score forDark Star. All too often, documentarians forget the power and enrichment music can bring to a film. However, Sallin realized its importance and knew she wanted to work with Scherer after hearing his work on More Than Honey. 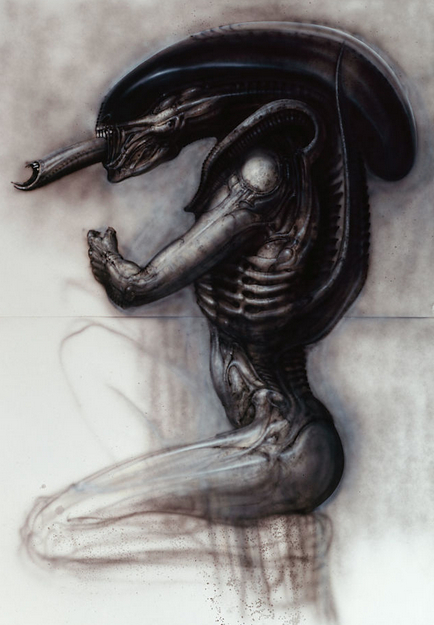 According to Sallin, Scherer had an “affinity for” Giger and his art, and he worked closely with her and the editor. 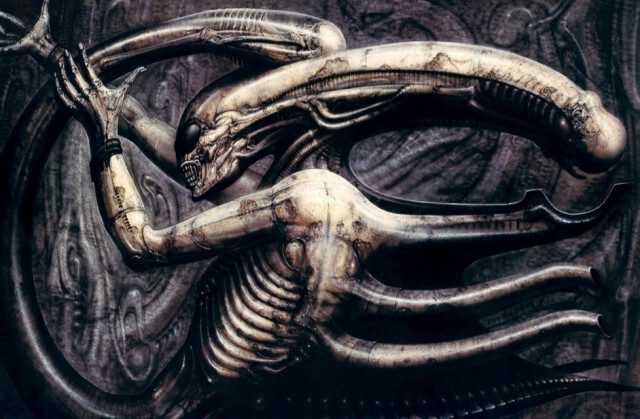 His particular sensitivity to the project exhibited itself in the film’s score, matching expertly with, not only the tone of Giger’s work, but also with the film itself. 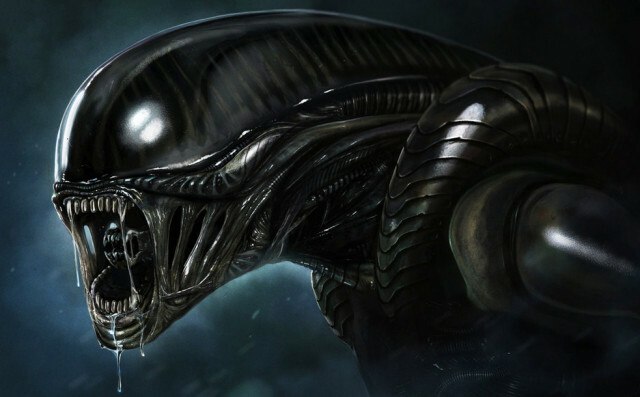 Even though Giger passed away only months before the film’s premiere, he was able to see a teaser trailer and was reportedly pleased with what he saw. 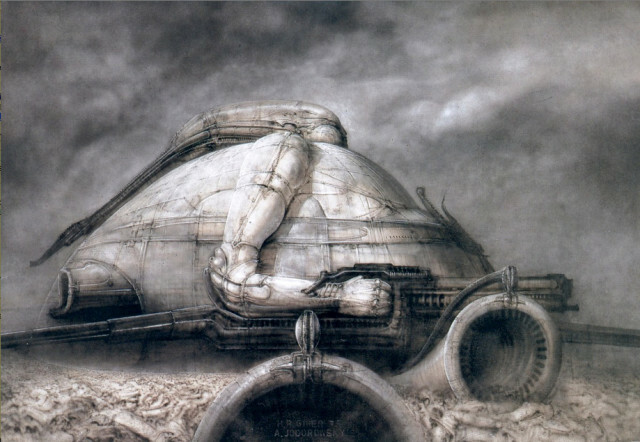 Words were not Giger’s medium, as evidenced by the minimal dialogue in the film. According to Sallin, Giger eased up when he realized she understood this. 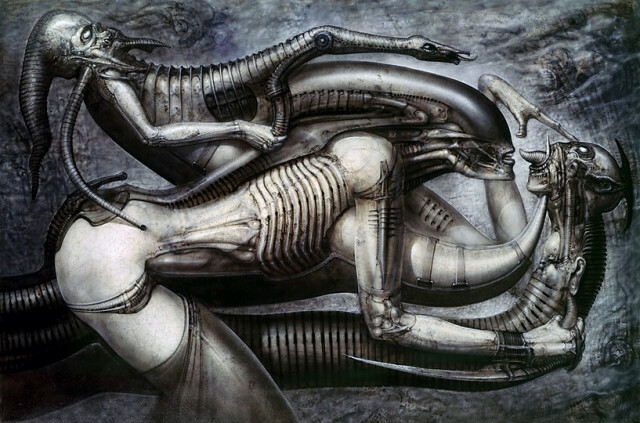 She thus worked to reveal Giger’s life through image and texture rather than rely solely on talking-head interviews. Watching the film, it becomes quickly apparent that Giger was of ill-health, and it seems that he realized this was his last chance to show the world who he was. Sallin believes that he knew this was his last performance. In some ways, the film can feel too much like a portrait created by a star-struck fan. While this may seem like a drawback, Sallin has been able to create a living testament to the man Giger was and the work he created without overtly pandering. Though Dark Star may not reveal anything revolutionary, it offers a satisfactory jumping-off point for those interested in this enigmatic man. This isn’t to say that the film will leave a Giger fan bored. The captivating music pairs seamlessly with the numerous montages of Giger’s works and the atmosphere is intoxicating enough to enrapture even the most diehard fan.